Are you interested in pursuing a career in healthcare? Are there careers you feel you're not too familiar with, but would like to learn more about? Would you like the opportunity to meet and talk to professionals from diverse fields in healthcare? On Monday, March 6th, the Black Medical Students Association is holding a multidisciplinary event for students who are interested in learning more about careers in healthcare. Our event offers not only a unique opportunity to learn about a wide variety of careers in healthcare, but allows students to network with professionals in a small group setting. The event will be organized in a way that allows groups of 2-4 students to speak to different professionals at a time. Professionals and students from fields such as Medicine, Occupational Therapy, and Audiology will be there to answer your questions and share their journey to their respective fields. Free dinner will also be served! 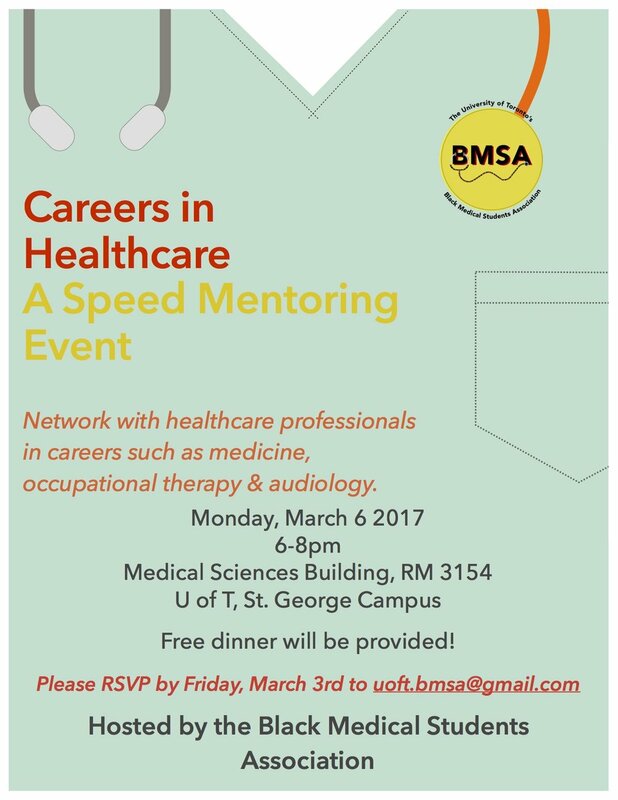 If you are interested in attending, please RSVP by emailing us at www.uoft.bmsa@gmail.com by March 3rd.